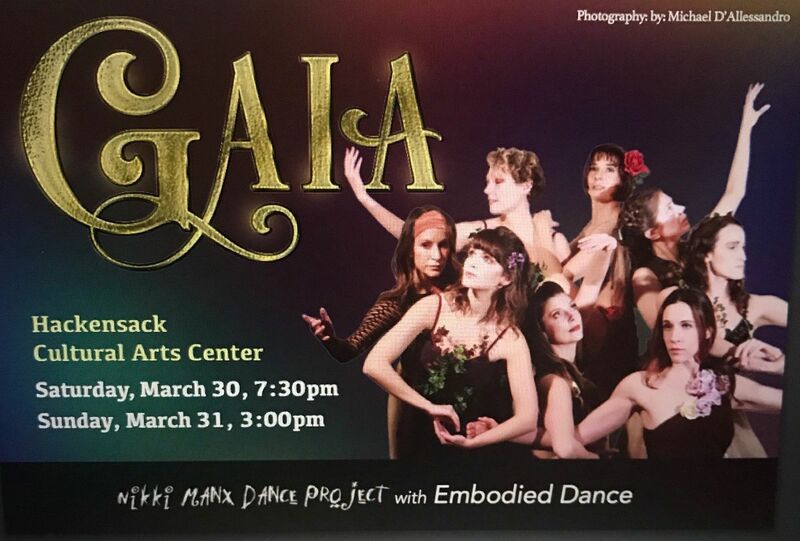 Join Nikki Manx Dance Project with guest artist, Embodied Dance, for the premiere of new work with our 2019 season, Gaia. Choreographers Nikki Manx and Allison Pagano (Embodied Dance) will premiere dances of air, water, earth, fire and waste to reconnect us to the Earth and awaken our human potential in this split program. These two all-female companies heighten the importance of ecological and environmental necessity and responsibility by awakening our consciousness to the Earth goddess, GAIA. Share in the infinite capacity of dance to awaken human potential and to reconnect us back to ourselves as part of and with the Earth. Experience the premiere of Consumed, exploring the company's personal relationship with the amount of waste we create and Of Which We Breathe with LIVE harp by Pamela Bruce and the renowned accompaniment of tabla and a percussive soundscape by Seth Moutal. Join us for a youth-based Dance Jam in the art gallery at 7pm pre-show Saturday. Enjoy complimentary parking on Sunday and a post-show Q&A with Company Directors Nikki Manx & Allison Pagano for a look into the choreography. Both shows will include a performance by the Art of Motion Junior Performance Ensemble, a nonprofit cultural and educational performing arts studio founded by Lynn Needle and directed by Nikki Manx and Laura Van Dyke. This program has been made possible in part by a grant administered by the Bergen County Department of Parks, Division of Historic and Cultural Affairs from funfs granted by the New Jersey State Council on the Arts.